The City of Orlando is located approximately 20 minutes drive from our vacation homes. All of the following attractions and places of interest are all located within the Downtown Area. 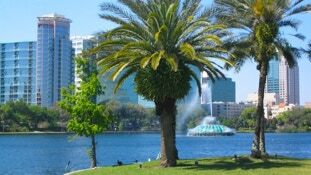 LAKE EOLA: Located at the heart of Downtown Orlando is the beautiful Lake Eola. Take a stroll around the beautifully landscaped gardens and take in the spectacular view of the skyline. Take a swan boat ride out on the lake. For a relaxing Sunday don’t miss the weekly Farmer’s Market featuring baked goods, crafts, fresh produce, flowers, and more. Lake Eola is host to many events and festivals throughout the year. ORLANDO REGIONAL HISTORY CENTER: For 12,000 years people have made their home in Central Florida. Learn the history including the Seminole Indians, the Spanish Conquistadors, the pioneers, citrus growers, Tin Can Tourists, aerospace engineers, and Walt Disney World. Located in the beautifully restored 1927 courthouse, the History Center offers a fascinating insight into how the region made its transition from a small town into an international destination. ORLANDO SCIENCE CENTER: With four floors of exciting exhibits, hands on learning, interactive exhibits, amazing giant screen movies, and live programming, the Science Center is the perfect family destination. Orlando Science Center is the place that inspires curiosity and exploration. 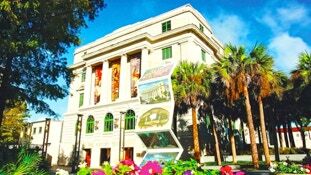 ORLANDO MUSEUM OF ART: The collection boasts more than 2,400 objects including American Art from the 18th century to 145, Art of the Ancient Americas, African Art, and Contemporary Art along with a rotating series of traveling exhibits. HARRY P. LEU GARDENS: The historic gardens include 50 acres of tropical plants, palms, cycads, the second largest camellia collection in the United States, a tropical stream garden, and the largest formal rose garden in Florida. The Leu House Museum is a beautifully restored late nineteenth century home listed on the National Register of Historic Places. DR. PHILLIPS CENTER FOR THE PERFORMING ARTS: Comprised the 2,700 seat Walt Disney Theater and the 300 seat Pugh Theater this is the venue for live theater, concert performances, ballet, and more. ORLANDO CITY STADIUM: The 25,500 seat home of the MLS Orlando City SC soccer team. AMWAY ARENA: The 17,000 seat home of the NBA Orlando Magic basketball team and venue for concerts and events. CAMPING WORLD STADIUM: The 60,000 seat stadium is host to the annual Citrus Bowl and other events throughout the year. SPECIAL EVENTS: Special events add a special spark to downtown. The Orlando Fringe Festival, Orlando-Shakespeare Festival, Citrus Bowl Citrus Bowl Parade, Fiesta in the Park, and Fourth of July Fireworks in the park are just a few!